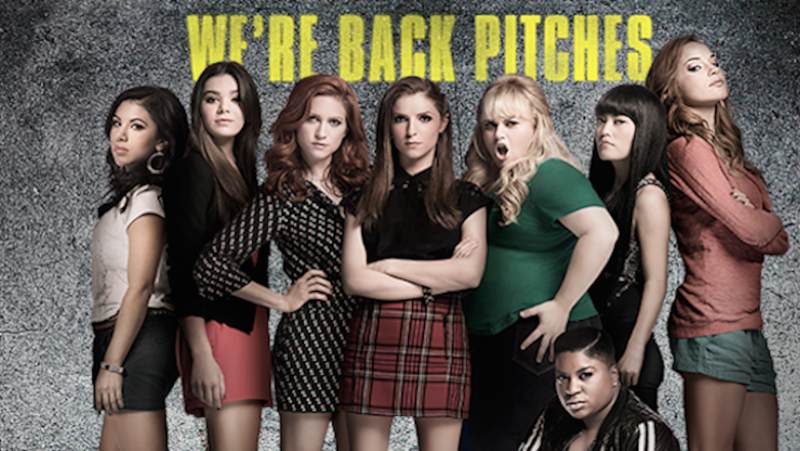 Back in the summer of 2012, Pitch Perfect came out and became a sleeper hit. It continued to do gang buster sales once the DVD/Blu-Ray was released and Anna Kendrick’s single “Cups” was constantly being played by radio stations. It should come as no surprise that a sequel would follow. The Barden Bellas have the opportunity to have their biggest performance to date when they get to perform for President Obama and the First Lady at The Kennedy Center. 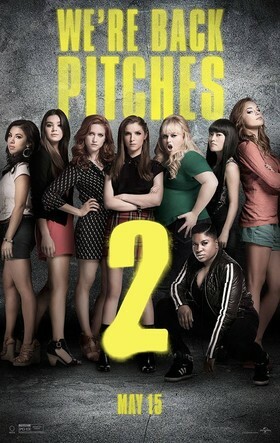 Their performance turns disastrous when Fat Amy (Wilson) has a wardrobe malfunction and stops the show. The incident now known as “Muffgate” makes headline news, and the Bellas face severe consequences from both their school and the collegiate a Capella organization. The glimmer of hope for them comes with the news that they are able to keep their spot in the world competition. As they prep for the big competition in Copenhagen, the Bellas find themselves going through a bit of a change in what they find important in life. Beca (Kendrick) has senioritis and is focused on her future when she receives an internship at a local recording studio. Former Treblemaker Bumper (DeVine) is desperate to prove his love to Fat Amy. Emily (Steinfeld), a newcomer and legacy, makes her way into the group without an official audition and has great potential. The group has to find the harmony and rhythm within themselves in order to win and beat their toughest competition, a German group known as Das Sound Machine. There’s always a sigh of relief when the whole crew comes back for the sequel. Anna Kendrick, Rebel Wilson, Brittany Snow, Adam DeVine, and Skylar Astin are all back along with Hailee Steinfeld (True Grit) as newcomer Emily and Katey Segal (“Sons of Anarchy”) as her mom. Steinfeld has a nice voice that is reminiscent of singer-songwriter Sia. Not sure if this is by coincidence or not, but Sia and Sam Smith co-wrote the brand new song “Flashlight” that her character writes in the film. It’s a fantastic anthem that will hopefully be a hit like “Cups” was in the first film. Writer Kay Cannon, who also wrote the first film, succeeds at making each individual Bella stand out. It’s a diverse group and each girl gets their moment to shine with their unique personality traits. Chrissie Fit plays new Bella Flo, who’s from South America and continually thinks something traumatic is going to happen to the group. Hana Mae Lee has more screen time as the low talking Lily. Ester Dean has a killer voice and is one of my favorite Bellas, Cynthia-Rose. Cannon also accounts for why the leader of the group Chloe, played by Brittany Snow, is still a part of the group despite being a senior in the last film. The only notable member absent this time around is director Jason Moore. Fans should not worry as actress Elizabeth Banks has stepped up to the plate and is making her directorial debut. She is an extremely gifted comedic actress, and she really knows how to deliver that in her directing as well. I’m relieved that she still allowed herself to act in the film as Gail, one of the co-commentators along with John Michael Higgins (Best in Show). They have so many scene-stealing moments and their jabs at each other are priceless. One of the best things about the first film was the music and the vocal arrangements made from current pop hits. Part of that spontaneity and glee to break into song is missing in this film. The studio touted that the film uses a massive number of songs throughout the various medleys and performance numbers. Oddly enough, I don’t think I would have realized that if the studio hadn’t promoted that concept. Maybe they switch from one song to the next too quickly. The overall music supervision and selection was not as lively this time around. Now I don’t know if that has to do with rights or the way the story is structured, but I wish we could have had more music in the first half of the film. We do get a fun riff-off early on, but I think they could have played around more while the group is in disarray. As they start to gel again, so does the music. I found myself singing along more in the second half of the film when the story starts to sync into place a little better. I may be nitpicking too much for some people, but I spent many years in high school and college show choirs. Those are just minor details for a film that has to take what we loved about the first film and try to replicate that magic without feeling like it’s the exact same movie again. Sure, some of the jokes and bits are recycled from the first, but that’s completely normal in comedy sequels. There are plenty of fun cameos throughout the movie. I’m only going to spoil one by saying that Snoop Dogg is working on a Christmas album at the recording studio Anna Kendrick’s Beca is spending her internship. Snoop and Anna’s duet is on the soundtrack! If you loved the first film, you will love this one as well. It’s touching, inspiring, and doesn’t disappoint for fans that love these characters and a Capella music. A third one is probably in the works, but I don’t think it’s necessary. Is It Worth Your Trip to the Movies? It’s a toe tappin’, sing-along good time.